The last few years have seen an evolution in the gear I use and own. I’ve progressed from wool solids and external frame packs to finely tuned high quality gear. I continue to be impressed with the innovations and technologies now available. As hunters, it’s a great place to be as gear technology and options are expanding exponentially making it a tough balance to stick with what works vs. try the latest and greatest. Since 2006, I have cycled through several packs trying to find a balance of durability, load carrying capability, and most importantly fit. Each “upgrade” helped me move closer to what I was looking for, but I never could find the perfect combo. My trouble with packs is that when I get much over 50lbs, they start to sag off my waist, primarily at the small of my back. I have to constantly tighten the waist belt and it’s a nagging issue that I have dealt with over the years. Convinced this issue could be at least mitigated, I began to look around at different packs. Several things pointed me to Stone Glacier, the chief being the light weight and configuration options. 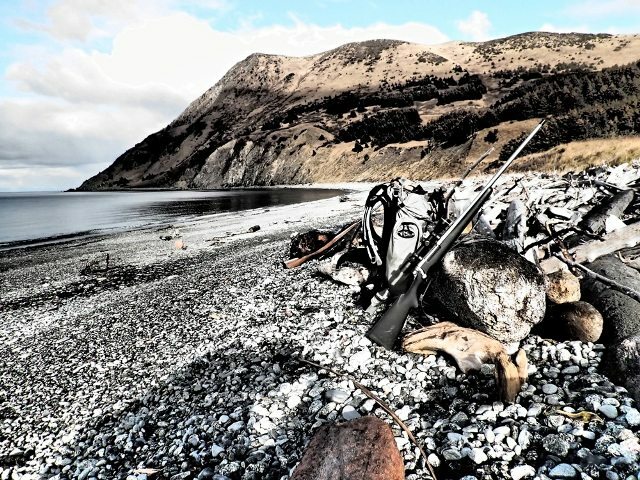 As an Alaskan sheep hunter, weight is always a key component of gear decisions. The Sky 7400 is incredibly light considering its size, durability, and capability. In early 2014, I reached out to Kurt Racicot at Stone Glacier with some questions. I had read about his packs and wanted to know more. After our conversation, I ordered a Sky 7400 with the three-piece waist belt. I received my pack, and after some brief struggles, I decided to check the directions ! The video instructions on Stone Glacier’s website were a great resource and the pack was pretty simple to tune. With the pack adjusted to me, it was it was time to try it out with a load. would not stay up on my waist once I threw a load on. I spoke with Kurt about my issue. He appreciated the feedback, told me hang with him, and sent out some extra padding to thicken the lumbar pad. This somewhat worked, but still did not solve my issue. Kurt was persistent in his efforts and sent me a few different lumbar pads to try out, and I’ll be, one of those pads worked! The Stone Glacier Sky 7400 was now fitting better than any pack I had worn or tested up to this point. As time under the pack went by, I ended up a bit frustrated with the hip belt pulls. For guys in the sub 32″ waist category, the 2014 standard issue hip belt pulls can potentially twist and not work. Kurt worked with me to resolve the issue and sent me a pull with an extended tail that Velcros farther back into the waist belt. I tested these new pulls and they work as I hoped they would. They were used for the last half of my 2014 pursuits with no issues. If you are small-waisted, it’s worth checking with Kurt before ordering the standard pulls. I would like to see the pulls integrated into the belt somehow, but the longer pulls work and my issue is now solved. For 2015, Kurt has redesigned the material on his standard pulls to reduce the twisting. My one real complaint with the Sky 7400 was the chest strap. It would twist slightly or come off the sliders if I was not careful with it. I’m not sure how this could be improved, but I was able to overcome the issues, it just required me to pay more attention to the sliding connections than I wanted to. While it took some effort get my Stone Glacier dialed in, I was impressed that Kurt did not view my fit struggles as a frustration, but rather a challenge and learning opportunity for Stone Glacier. He really worked hard to help me get my pack dialed in. I utilized my Sky 7400 on my 2014 Sheep Hunt and on my 2014 Raspberry Island elk hunt support trip. Between those two adventures and summer hiking trips I have 30+ days and well over 100 miles under the pack now. In addition, I use the pack a few times a month as part of my workout routine. I don’t yet have any pictures of successful kills to tout the load carrying capabilities of my Sky 7400. I have carried loads from as light as 20lbs to as heavy as 70lbs+ and the pack meets my expectations. The lid highlights the versatility the Sky offers as the pack is easy to use with or without the lid. When the pack is not full, it easily compresses down and can be run in a streamlined mode, without the lid. I typically throw the lid inside the pack as I keep certain items in the lid pocket. It makes for a convenient pull out bag. Once you get the hang of it, it’s pretty simple to take the lid on and off as needed. If you want to cut weight, the pack works fine without the lid. For 2015, I’ve added one of the new larger hip pockets, an additional Camp Pocket, and the Sky Top compression straps for additional load carrying optionality. I am optimistic for this year’s sheep hunt and the straps seem like an ideal way to attach a pair of horns or antlers. The extra camp pocket will replace a small stuff sack I have been using. The beauty of the camp pocket is the ability to secure it inside of the Stone Glacier and its translucent color makes identification of contents a breeze! It’s also simple to remove if needed. When setting up the pack, I took Kurt’s advice and ditched the hydration bladder I had been using. I utilized a combination of a 20oz Camelbak bottle and two (1) litre collapsible Vapur bottles. This, combined with the hydro holster, was the ideal setup for me. It saved me the hassle of a water bladder, yet provided the easy access I was looking for. I am convinced that the Stone Glacier Krux suspension/ frame can hold its own among the top tier packs on the market. Additionally the load shelf allows for serious gear hauling capacity and versatility. 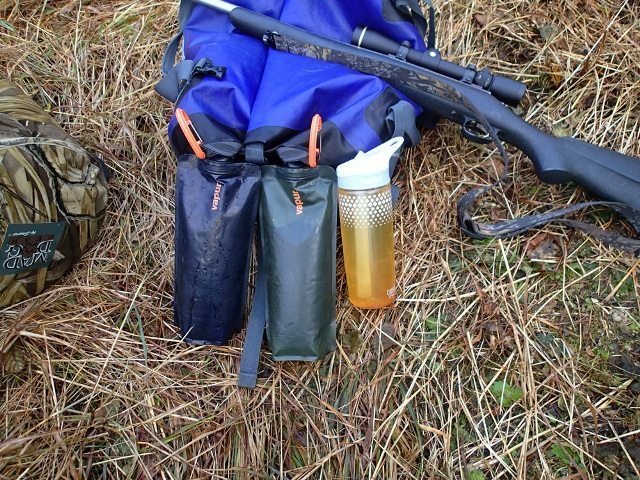 For me, it all boiled down to fit and configuration for my style of hunting. 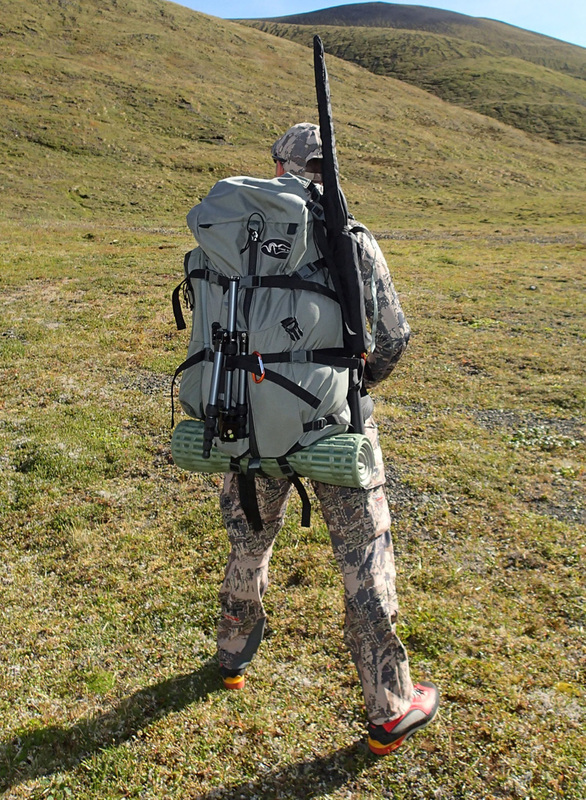 The Stone Glacier Sky 7400 took some work to fit me, but it is now the perfect pack for how, where, and what I hunt. For what it’s worth, my sheep hunting partner became very interested in my pack and we had some good conversations about the differences between our packs during our sheep hunt. After hearing about how Kurt treated me, and seeing my pack in the field he ordered up a Sky 7400 himself. If you are like me, you typically grab the product and just start using it. Instructions, who needs them? Don’t be like me. Stone Glacier provides some great tips on how to set up and customize your pack. I HIGHLY recommend you check these out here before you buy, and definitely before you slip under the shoulder straps. Kurt spent a lot of time putting these together and you owe it to yourself to take some time and view them. 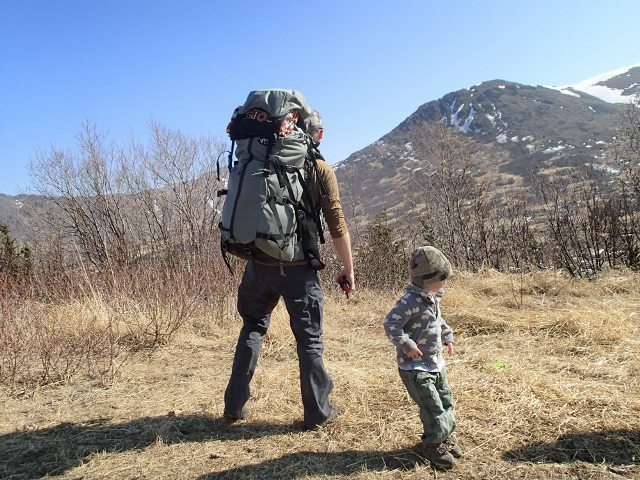 They provide insight into the pack, design, accessories, and fit that are key considerations, either as you debate pack options or are seeking to optimize your purchase.